Mobile is so different from the desktop: whereas we search on the desktop, on mobile we use apps. But everything’s siloed in apps. So how do you get it out of the silo? What’s the way to get everything at your fingertips, organising your life in the way that Google organised the web? Lowdown is to mobile what Google was to the early web. Most Exec’s, CEO’s and Business Owners are interested in the people and companies they meet. To prepare for these meetings you currently need to spend time searching websites and apps. Lowdown does this for you (and for your personal assistant), by presenting a map, the profiles of the attendees and company information, all in an instant, from a simple and standard calendar invite and now it will do it for FREE. Lowdown for Meetings was launched on iPhone globally in July 2014. Since then thousands of Business Owners, Corporate Executives and other Professionals have saved hours preparing before each meeting thanks to Lowdown. Having launched with a £5 a month after a 30 day free trial pricing model Lowdownapp Ltd successfully raised investment funds to remove the fee and go FREE. Lowdown 2.0 is the first update of the service since 10th August. In addition to being updated for iOS8, a simplified user experience and now going FREE, Lowdownapp Ltd has also incorporated the successful companion app xxxx (to be renamed due to Nokia legal threats) into the Lowdown service, so people can view their important meeting info on people and companies and then, in one tap, notify the attendees of their arrival (also with a Selfie). Since launch, Lowdown has assisted professionals with over 200,000 meetings - considering most people spend 15-30mins preparing before each meeting by searching websites and apps that's a nice tech driven efficiency driver for the global economy. In 2015, mobile first services, like Lowdown, that automate mundane tasks using NarrowAI are becoming a critical time saver for professionals, focusing on delivering information in context without the need for search, "Faster than Search" and allowing people to focus on less digital and more human interactions and relationships. Meet before you've met with Lowdown. "I think Lowdown could drive a new wave of change in how we use our smartphones. Our devices can already know everything about us - our contacts, our plans, our itineraries - but they’re fragmented into different apps. Lowdown pulls them together." Charles Arthur, technology journalist since 1984, former technology editor at the Guardian, science & technology editor at The Independent, technology features/news editor at New Scientist. Lowdownapp Ltd was founded in July 2013 by David Senior & Michael Worley who have already established a mobile strategy company, Spark33. During their careers in technology consulting and mobile user-experience + the many meetings they attended over the years led to the creation of Lowdown, which automates an hours meeting prep in an instant. Privately owned and located in London, UK, the company is committed to developing next-generation productivity applications for consumer and business. The team at Lowdownapp Ltd combines over 20 years of technology consulting experience, working with international blue chip organisations, with six years of ‘new’ mobile services development and consultancy in apps. Updated 12th February 2015, London, UK Amendment: Subsequent to the events below, we have been in contact with HERE's representatives and agreed to remove their name from our apps. HERE has accepted our request for a longer, two month period for us to make the changes. We now consider the matter to be closed. 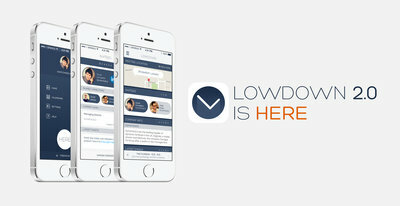 Lowdownapp Ltd offers customized 'Faster Than Search' mobile service for businesses. With the advent of new mobile first business services that automate mundane activities, such as searching websites and apps for information - Lowdown, the consumer app for Meetings is now available to businesses via Apple's Volume Purchase Program. Trends in app unbundling, a gazillion messaging apps as well as super simple apps that do one thing really well led us to create xxxx. Lowdownapp Ltd, following the success of Lowdown for Meetings and at the request of our users has created the companion app xxxx v1,2 Photo xxxx - a one tap way to take a selfie and notify your arrival - at a business meeting, party, the arrival of a baby or your arrival at an airport (+ others).